“The pursuit of perfection,” the mission statement of Lexus, is embodied in the Lexus RX 350. We took possession of a 2010 cerulean blue AWD model this past Wednesday. After spending the greater part of two days reading manuals and discovering the features of this technologically advanced vehicle, we drove it to Flagstaff and back yesterday. What a joy to drive! In addition to its standard performance, safety, luxury and convenience features, our crossover SUV has the following additional equipment: the comfort package with bi-xenon headlamps, adaptive front lighting, intelligent high beam, rain-sensing wipers, heated and ventilated driver and passenger front seats; a 12-speaker audio system with in-dash 6 disc CD-changer and the ability to attach an iPod, MP3 player or bluetooth device; 19 inch aluminum alloy wheels; a navigation system; intuitive parking assistance; the premium package with leather trim interior, moonroof, heated outside mirrors, MP3 mini-plug and USB audio plug; the tow prep package with a heavy duty alternator and radiator; wood and leather trimmed steering wheel and shift knob; the accessory package with cargo net and mat and wheel locks; and roof cross bars. Reading the owner’s manuals requires some dedicated time as the Owner’s Manual Quick Guide is 69 pages while the Ownwer’s Manual itself is 656 pages. The Navigation System Owner’s Manual is 435 pages, the Lexus Enform User’s Guide is only 40 pages, while the Warranty and Services Guide is 76 pages. A Lemon Law Guide is included, but it is hard to imagine ever being needed for this particular vehicle. A DVD and interactive CD-ROM offers a visual product presentation, quick guide and how to’s, plus navigation and audio system tutorial. 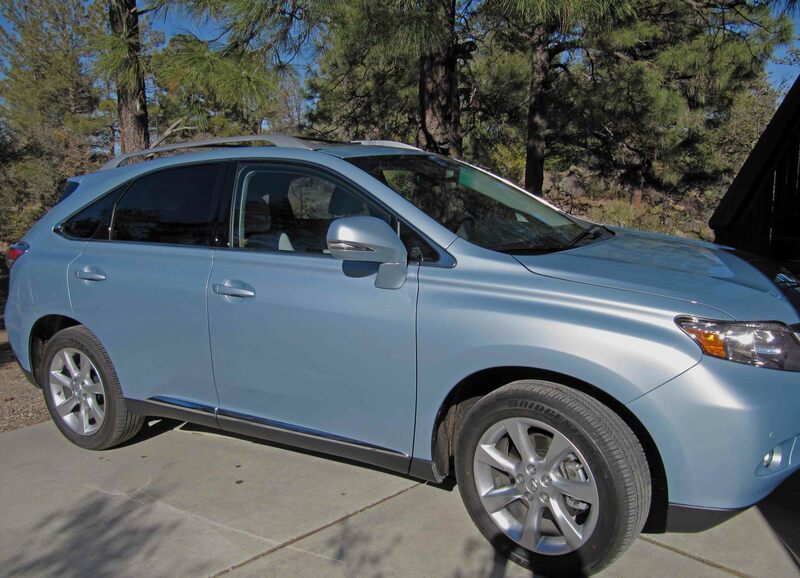 We hope to take many road trips in the coming years in our new Lexus RX 350. On this beautiful Valentine’s Day in Phoenix, we hiked along the National Trail on South Mountain from Buena Vista to the Towers. 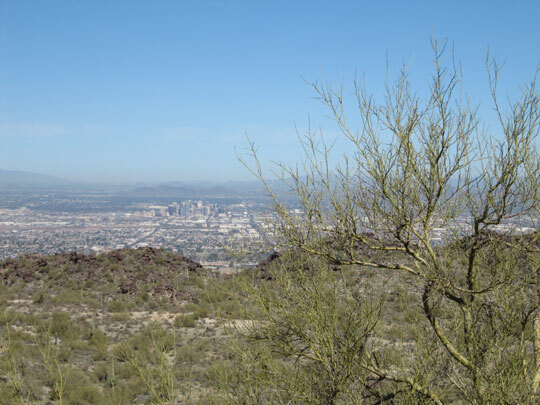 This flat hike offers panoramic views of the distant Phoenix cityscape. A variety of cactus was evident, from the stately saguara to robust red barrel cactus. The cholla or teddy bear cactus was showing new growth. Devil’s claw, a low-lying black growth used in basket making, was also seen in a few spots. The mountain side itself was green from all the recent rain. Nice hiking and a welcome respite from dealing with car salesmen yesterday. According to William Beebe, “Modern man’s trip to the zoo…is his emergency return to nature.” Today we headed to the west side of Phoenix to visit Arizona’s largest collection of exotic animals. The Wildlife World Zoo has more than 3,000 animals representing some 600 species. This privately owned and operated zoo opened in 1984. The Aquarium opened in 2008 and includes the Tiburn Restaurant where we lunched on the patio, enjoying colorful flamingos and macaws swaying to the beat of music. The following observations are based on those animals who posed for snapshots. 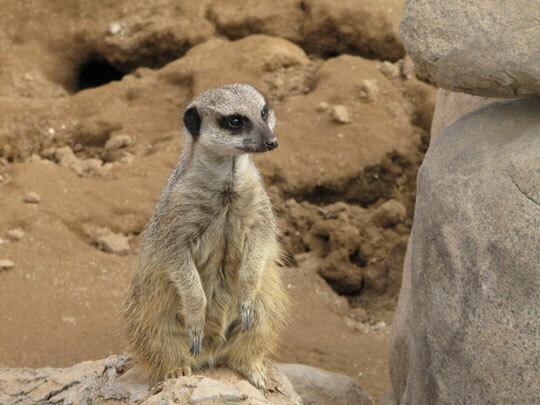 The slender-tailed meerkats from South Africa belong to the mongoose family but are similar to North American prairie dogs. Schmidt’s spotnose guenons are colorful monkeys with blue on their face from Northeast Congo and Uganda. The patas monkey or red guenon is considered the fastest of all primates, running across plains up to 35 miles per hour. A white-handed gibbon from Southeast Asia kept its two week old baby close. Reticulated giraffes were continuously being fed by visitors. African spurred tortoises, the third largest tortoise in the world, growing to 200 pounds, were quite active. They fully mature between 20-30 years of age and live a century or more. They can survive for months without water just by eating plants and grasses. The Arabian oryx, saved from extinction through the breeding program of the Phoenix Zoo, displayed frisky behavior during our visit. The addax antelope is a desert antelope native to the Sahara Desert. 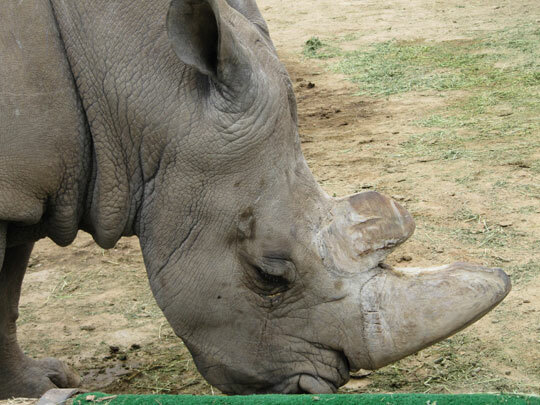 A white rhinoceros, weighing two and a half tons from East and South Africa, has a broad flat mouth and lip for grazing savannah grasses. The South American tapir has an elongated snout and upper lip and enjoys wallowing in the mud. In the Kangaroo Walkabout we observed a mother kangaroo with her baby peeking out of her pouch. In the Aquarium, we saw several green moray eels sticking their heads out of caves. One eel, however, was looking for a new cave and we could see its long, ribbon-like body. The discus, colorful tropical fresh water fish from the Amazon River basin, played tag with one another.